HEAT STROKE IS AN EMERGENCY! Why dogs are so susceptible, how the canine thermostat works, humidity heatstroke and how to prevent or treat sunstroke. If you suspect your dog is having heatstroke scroll down. Otherwise, let's talk about prevention and note that dogs are more susceptible to heat stroke and sunstroke than humans. Here's why. Dogs can't sweat like people and horses; open mouth panting is his only way to dissipate heat and keep vital organs functioning. High humidity impedes his thermostat. 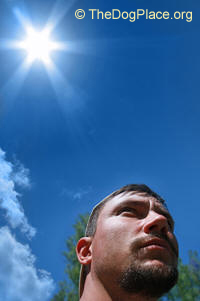 On a hot, muggy day, your body is cooled through sweat evaporation. Your dog can only pant to dissipate heat and when humidity is high, he has to work even harder. Human or canine, the body’s thermostat uses a lot of energy. Do you get grouchy when it's oppressively hot? Just a little bit peevish? So does your dog. Dogs must be sainted because they are less likely to be short tempered with family than you are after a "bad day" and a long hot drive home from work. Even so, give him some emotional space on "dog days". Don't freak out if he digs a cool damp bed in your manicured lawn, especially if he is double coated. And remember, the darker his coat color, the more of the sun's heat it will absorb. If you insist on showing at outside summer shows, for goodness sake, have pity on him. Take a big ice chest. Not for your beverages. For the dog. If you want ice for your drinks, take a smaller one for yourself. Pack an old bath towel. Keep it in his ice chest. Wring out the towel and drape it over him for that long wait at ringside. Fill his spray bottle with plain cold water from the ice chest or bucket. If he's heavy coated, put cold packs under his crate pad. Treat him better than you would your child in severely hot weather because he can't tolerate heat and humidity as well as your child can! Better yet stay home. One more thing about summer shows. Direct sun will burn that gorgeous dark coat, turning it rusty. Avoid all oily coat dressings in summer as the hot sun will "fry" his coat. What's worse than walking the fairgrounds or concert event with your dog? Putting him in the car!!! Never leave him unattended. Surely you would rather mercifully shoot him than torture him to death in a car which you thoughtfully parked in the shade – until the sun moved and 30 minutes later, he was trapped in a virtual oven. Don't ever leave him in the van or motor home with the air conditioner running. If the engine becomes overheated and shuts off, your dog can die in less than twenty minutes. Only a "few minutes" of ringside chat or goodbyes can kill your best friend. Despite all the warnings and the presence of professional dog people, show dogs die from heat prostration every summer. Dogs are also more susceptible to bloat and gastric torsion in high heat due to increased water intake. Build a roof. Provide access to the garage or utility room, if necessary, install a window air conditioner but do not lock him in! If the power goes out, your dog will die. Better yet, install a doggy door which allows him access to your cool kitchen floor and the central air conditioning. Add a little ice to his fresh water; he'll love it just as much as you look forward to a cold drink. If he hasn't been wormed since fall, now is the time to make sure both internal and external parasites are under control. Shedding? No doubt. A good bath, regular brushing, and flea control will make his summer a lot easier and avoid vet bills for "skin problems" and summer doldrums. Don't hose him on a hot day because unless he stays out in the sun long enough to dry completely (and no dog would do that) the dampness trapped next to the skin is likely to erupt into moist eczema otherwise known as a "hot spot." Do not ever, ever, ever do a mating in the heat of the day. And never give him a "nice, big cool drink" immediately following any sort of vigorous exercise, even on a cool day. Give ice cubes to satisfy his thirst and cool him down. Change his diet. Don't you naturally cut back on heavy gravies, sauces and fats during the summer? Sure you do. Your dog would too if he could select his own food. It's a shame dog food companies haven't come up with a summer diet but until they do, shift him to one of the lower protein mixes made for older or overweight dogs. Not a cheaper grocery food, but a lower fat formula. Always avoid corn-based foods but particularly in the summer. Corn is “hot” food, ask any horseman. Add a bit more veggies. With puppies, it doesn't matter so much because they are going to burn off the fat and protein, just like small children do. 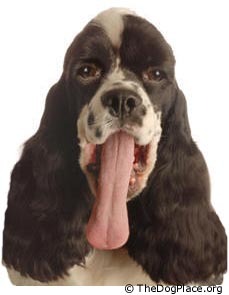 If your dog is panting excessively, has labored breathing, is weak, staggering, disoriented (doesn't respond normally when you call his name) has a bright red tongue but gums are pale, his pulse (heart rate) is rapid, or he has thick saliva, especially in the back of his throat which further impedes breathing, he needs immediate help. A dog can have any or all of these symptoms. If he is frothing or having difficulty breathing, clear his airway! Use a rag or paper towel to swab out his mouth, clearing his airways as far back into the throat as possible. Repeat as frequently as needed. Lower his body temperature. Run the hose until cold water comes out. Then wet him down, paying attention to groin and armpits. DO NOT use ice water or ice packs - cooling your dog too quickly can cause blood blood vessels to constrict and that can actually slow down the cooling process. Get him in the shade. Have someone fetch a rectal thermometer and check his temperature. If his temperature is over 105 notify the vet you are on the way as organ damage will begin to occur. If it is below 105, use your best judgment depending on his symptoms. The goal is to drop his temperature to 103 F. Normal temperature for dogs is 101.5. If his temperature is under 105 and he is responding to you, move him out of the sun, hose him gently, give him frequent small amounts of ice water but don't let him gulp. Do NOT leave a wet towel over him, it will slow the cooling process. If possible, set up a fan to help dissipate body heat. Monitor his temperature, his awareness of you, and his breathing. If it any point, he seems to be going into shock, call the vet and get moving! If after lowering the temperature, the dog still seems disoriented and/or is having trouble breathing (after you've cleared his airway of sticky slobber), regardless of his temperature, get him to the vet. 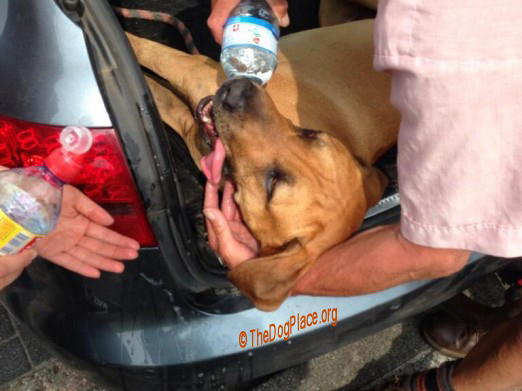 Re-wetting him with cold water and judicious use of ice packs will help him make it to the vet. We hope this article will help PREVENT heat stroke or help you stay calm and provide emergency care should heatstroke or sunstroke occur. Please share it with everyone you know who has a dog. Copy the URL below and drop it in an email. You can also print the article and share with friends who are not online. Take a copy to your dog club or have them contact us for a PDF with which to make flyers for summer shows. 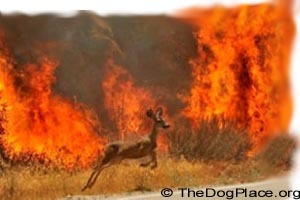 Owner escapes NM fires that killed countless animals. Prevent agonizing deaths in K-9 police cars and dog show vehicles. Dr. Lee show how to outlast weather or social disaster.